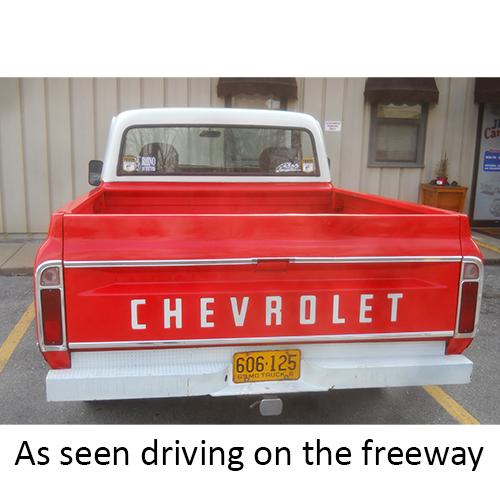 Suddenly, while moving with traffic, directly in front of our vehicle on a major interstate highway, was a very attractive 1969 Chevrolet ½ ton short bed pickup. We also watched other drivers and we could see it was certainly an eye catcher to them. The biggest surprise was that it was soon parking in the same building supply store where we were parking! This coincidence was just too great not to talk to the owner about his attractive little red Chevy. The more we discussed his truck, the more it seemed like a perfect candidate for our feature truck of the month series. The owner is David Griffin of Oak Grove, Missouri. He rarely drives it the 40 miles to his work, however, that day we saw him was an exception. It was his “fun” transportation to his job then and we were both going to shop at the same store. David told us the major part of the restoration was complete to almost factory specifications except for the interior. That will follow soon as time and money are available. Of course, for now it is a great driver but it is only out on nice days! 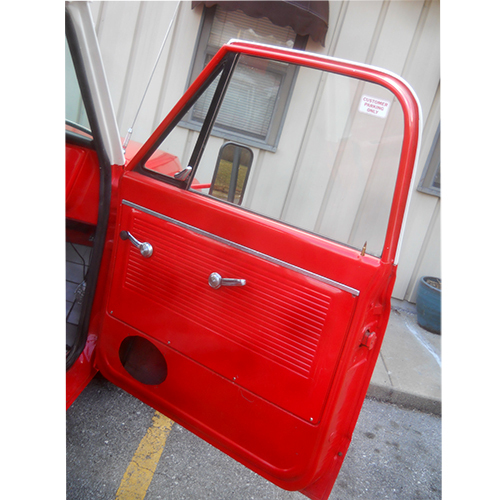 He continues to do the many other small restoration extras that need to be completed while it is his fun driver. 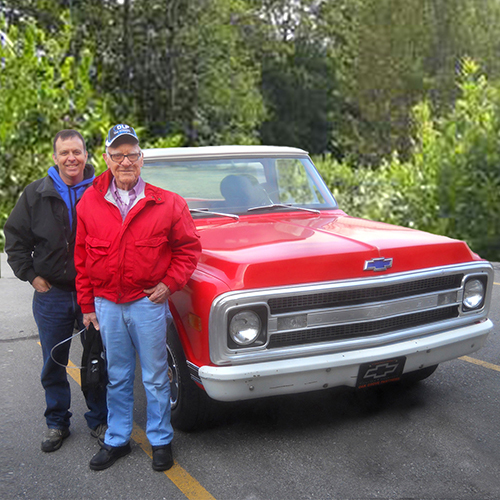 Here is what makes it so special to David: His grandfather, Jim Kuder, had owned it 15 years, personally did most of the restoration, and then gave it to David. What a gift and a surprise! 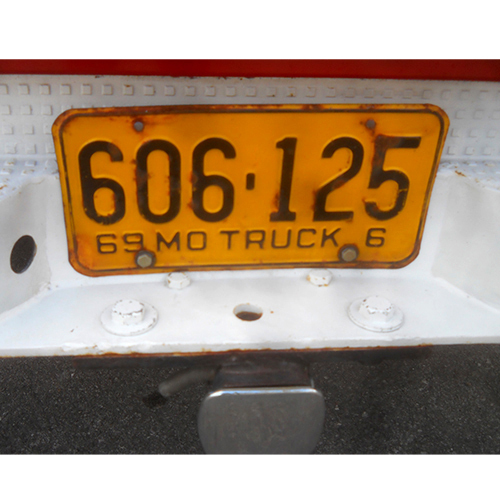 Jim has always been an avid collector and restorer of specialty vehicles. He still has such special completed cars such as a 1931 Model A Ford, 1954 Ford Sky liner (glass top Tudor), 1951 Studebaker, Ford Bronco, VW Dune Buggy etc. This special ½ ton was built just for his grandson, and this certainly gives David real pride of ownership! 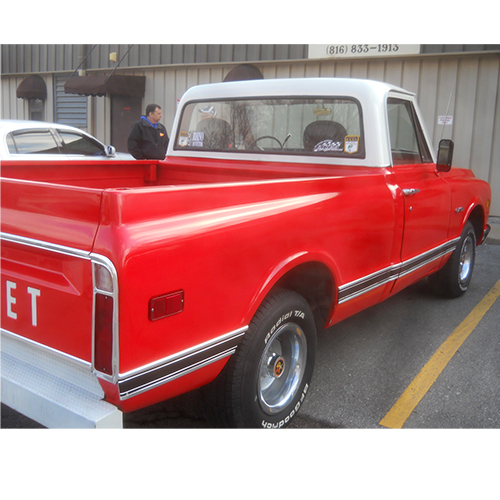 This 1969 Chevy pickup is painted the same colors as it came from the factory in Crimson Red with Polar White top. Jim bought it at a local antique car swap meet about 2003 because of it having so much restoration potential and it had the very popular short bed. The limited rust required only one cab corner to be replaced and most all was factory original. It’s tired 250 six cylinder engine and Power glide transmission were easily exchanged for a 400 small block V-8 and 350 Turbo Hydromatic transmission. This transplant pair came from a 1974 Chevy Bel Air Car. Unfortunately, the hope for this being a good engine was short lived. The timing gear broke soon after instillation and driving came to a stop. Jim must have had plans for David to later own the pickup because the V-8 was removed and given a major rebuilding, not just a timing gear. Even a 4 barrel intake manifold and carburetor were then added. With the powerful V-8, David has no problem keeping up with freeway traffic. It is the more frequent stops for fuel that reminds him, “Gasoline used to be much less expensive”. Speaker Hole. Do we use them or fill them? David is not new to older Chevrolet trucks. In high school his first truck was a 1964 Chevrolet ½ ton stepside long bed. He drove it another six years learning so much on how trucks operate and how to make the repairs that are required when driving an over 10 year old vehicle. Note: David did not realize at the time how unusual this high school pickup really was. Few long bed stepsides were produced by the mid 1960’s. 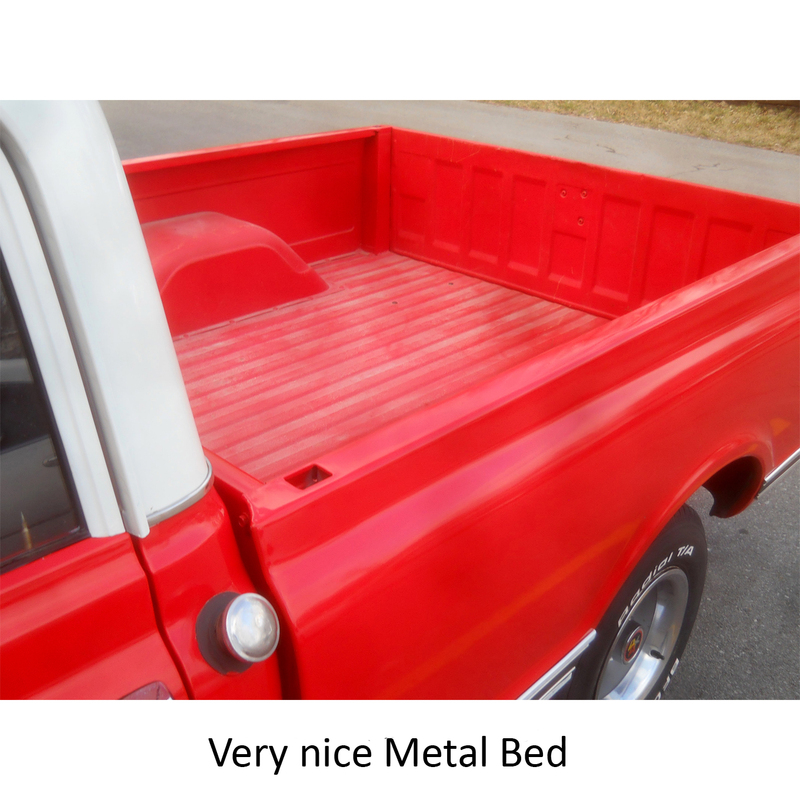 Most wanting a long bed, (usually for work) paid a little extra for the extended bed with the 127” wheel base, and got a fleetside pickup. This entry was posted on Monday, April 2nd, 2018 at 8:34 am	and is filed under Featured Trucks [unsorted]. You can follow any responses to this entry through the RSS 2.0 feed. Both comments and pings are currently closed.